LOUISVILLE, KY (June 13, 2018)—After a series of community engagement events and stakeholder meetings, Louisville Metro Government (LMG), working in concert with consultant Gehl Architects since 2017, has completed a draft plan to “Reimagine 9th Street” from the Ohio River to Broadway. Reimagining the corridor aims to implement goals of Vision Louisville, to pursue a MOVE Louisville priority project and to create an attractive, vibrant, and safe connection between west Louisville and downtown. An open house also will be held on July 10 from 6-8 p.m. at the Louisville Urban League (1535 W Broadway). 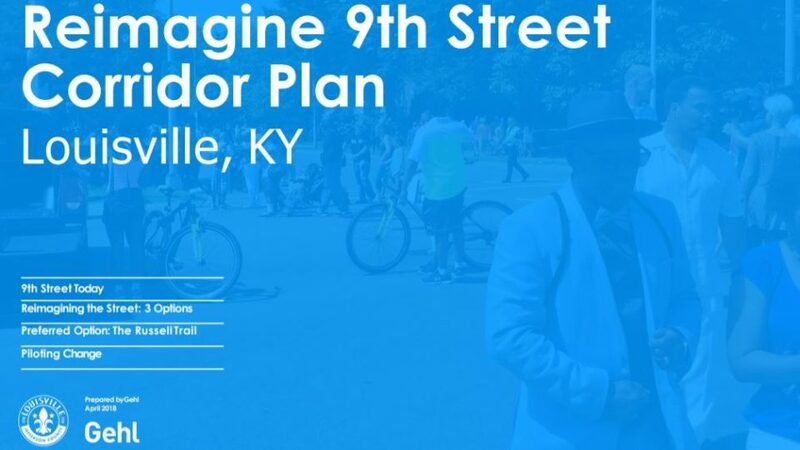 A public comment form is also available until July 30 at https://louisvilleky.gov/government/advanced-planning/reimagine-9th-street. An additional topic for discussion at the open house will be the realignment of 18th Street at Broadway, which is expected to begin construction in August. The conceptual plan, and subsequent infrastructure investments, are among many significant investments planned in and around the Ninth Street corridor, including the Choice Neighborhoods Initiative, which will revitalize the Russell neighborhood and transform Beecher Terrace into a mixed-use, mixed-income and multi-generational community. Other projects include a Waterfront Park expansion to 15th Street; westward extension of River Road; Dixie Highway Bus Rapid Transit (which will run along this stretch of Ninth Street); an arts and cultural district along Muhammad Ali Boulevard led by Louisville Central Community Centers; installation of The Louisville Knot, a public art piece that will activate the underutilized area underneath the I-64 ramp at 9th and Main streets; and stabilization of Quinn Chapel through a national grant. Plus, the soon-to-be realigned intersection at 18th and Broadway will serve as a hub for commercial activity, with Passport Health Plan’s campus, a new YMCA, and investment from OneWest. The Louisville Urban League’s track and field facility at 30th Street and Muhammad Ali Boulevard also represents a catalytic investment in west Louisville. As part of its study, the consultant team at Gehl reviewed existing conditions of the Ninth Street corridor. They found difficult conditions to cross Ninth due to few and far between crosswalks, speeding traffic and underutilized right of way and public space. Fischer notes that many of those challenges were intentional when the street was built, designed to divide African American neighborhoods from the rest of the city. “We need to be just as intentional about removing them,” he said. Despite the challenges, the study found many people are walking and biking along and across Ninth Street, and enjoying green space at Old Walnut Street Park. Gehl has suggested three options for creating a safer and more connected corridor, each focusing on pedestrian safety, multi-modal connectivity to encourage walking and cycling along with vehicular traffic and creative green spaces with places to sit and relax. All three options will be shared publicly to gather community input before a final selection is made. Fischer’s FY19 budget proposes $180,000 to begin formal design, and LMG is actively seeking to fund implementation, which could begin in 2020 with completion in 2022.